This series of thirty-two (plus) samplers is intended to be provocative and evoke emotion. It is a contemporary feminist interpretation of women’s work and an objectification of my personal experience. Each captures a moment, giving these words a visual presence, a power, and a state of concreteness. These words were hurled casually and heard quickly but required hours of time-consuming, careful stitching. The physically delicate, traditionally feminine, form of the piece engages the viewer and confronts him/ her with a sweetness that may mask its crassness and vulgarity. You read one sampler. Perhaps you are amused, but as you continue reading and consider the body as an entire collection, the response changes. The inherent filth emerges. It is a beautification of an assault. Perhaps in the moment these statements are meant to compliment, but most don’t find vulgar, highly sexualized statements whispered or screamed at them by random strangers complimentary. Rather, they are an invasion of personal space. 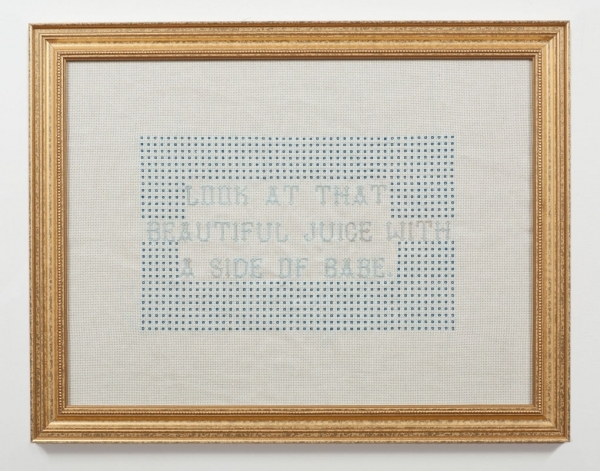 The body of samplers is a contemporary and unexpected response to unsolicited and unwanted attention. They reduce the complex emotional experience of being heckled by catcalls to a simple piece of women’s work.